Letterkenny Music & Drama Group are delighted to be presenting a brand new play for their drama festival production this year. “Beneath an Irish Sky” will receive its premiere in An Grianán Theatre on Tuesday 13th February 2018 prior to competing on the demanding Drama Festival Circuit. Inspired by archive reports and eyewitness testimonies, “Beneath An Irish Sky” is written by Kieran Kelly and looks at the events of the ‘decade of change’ from a Donegal perspective. Set in the town of Letterkenny between the years 1914-1924, it tells the fictionalised account of one man’s journey through those turbulent times, questioning what made him pick up a gun to fight for his country. The play depicts how the central character of Brendan McDevitt (Eoin Callaghan) was affected by the seismic events unfolding around him – from World War 1, through the War of Independence and up to the Civil War – and shows how these events convinced him to gradually move from the peaceful Nationalism of the Ancient Order of Hibernians into the more militant Republicanism of Sinn Féin. This life altering decision will have far reaching implications for both himself and his family. The various decisions he makes throughout his journey are all influenced by those around him, from the attitude of his parents Barney (Kieran Kelly) and Cassie (Elaine Gillespie), the actions of his brother Michael (Loic Cech), his neighbour Mary (Laura Doherty) and the political allegiances of both the local priest Father Crawford (Michael Leddy) and the persuasive Doctor McBride (Martin Hasson). The play opens in An Grianán Theatre, Letterkenny on Tuesday 13th February 2018 at 8pm prior to touring the drama festival circuit throughout February and March. It will also be performed in the Amharclann Ghaoth Dobhair on Wednesday 21st February. For more details, find the Letterkenny Music & Drama Group on Facebook and for tickets for what promises to be a dramatic night of entertainment contact An Grianán Theatre on 0749120777 or www.angrianan.com. We are pleased to announce our cast for this dramatic reading of Kieran Kelly’s new play. This March as part of our season of events to commemorate the 1916 Rising we will be holding a dramatic reading of a new play by local author and historian Kieran Kelly. Beneath an Irish Sky looks at the events of 1916 from a Donegal perspective. It is a fictionalised account of one man’s journey through those those turbulent times, questioning what made him pick up a gun to fight for his country and how one moment in his youth affected the rest of his life. A professional actor with 25 years experience, Charlie Bonner most recently appeared at An Grianán in the acclaimed Livin’ Dred production The Kings of the Kilburn High Road and in last year’s Lyric Theatre production of the Brian Friel classic Dancing at Lughnasa. Patrick McBrearty in An Grianan Theatre’s Frank Pig Says Hello, Irish Tour Ireland Sept to Oct 2014. Photo by Paul McGuckin. All rights reserved. From St Johnson, Patrick McBrearty made his professional debut in our production of Frank Pig Says Hello also with director David Grant. He is currently appearing in Sole Purpose’s Blinkered and will soon appear in Belfast Tempest, a huge Shakespearean production which will feature a cast of 200 performers. Jack Quinn has had a long and varied career and has appeared many times in An Grianán productions including our very first touring show, Brian Friel’s Translations in 1999. He also appeared in our Irish Times Theatre award winning production of Dancing at Lughnasa in 2002. Orla Carlin (right) in Fiesta, July 2014. Photo by Declan Doherty. Orla Carlin’s previous roles with An Grianán include Fiesta, Brian Friel’s Aristocrats. She has also performed with the Letterkenny Pantomime Society and in the Letterkenny Music & Drama Group’s Don’t Tell the Wife. Michael Leddy (second from left) in Bread and Roses Theatre’s Can’t Pay, Won’t Pay, July 2015. Photo by Rik Walton. Originally from Leitrim but now based in Letterkenny, Michael Leddy’s recent acting roles include Puddle Alley’s Bookworms and last year’s Earagail Arts Festival hit Can’t Pay, Won’t Pay! Jason Daly in Fiesta, July 2014. Photo by Declan Doherty. Jason Daly appeared in our production of The Freedom on the City in 2013 before going to Dublin to study at the Lir Academy of Performing Arts. He also had one of the principal roles in our original production of Fiesta in 2014. Hugh Carr and Tomás Barriscale are both graduates of our Youth Theatre programme. Tomás is currently studying science in Cork while Hugh is getting ready for his Leaving Cert and planning to study theatre and acting at college. This performance supported by Donegal County Council and the Ireland 1916 Centenary programme. A Terrible Beauty: Remembering 1916 is our short season of events inspired by the 1916 Easter Rising. We’ll have three shows, the first of which is a rehearsed reading of a new play by local writer Kieran Kelly. Kieran Kelly will be well known to An Grianán regulars as he has performed many times on our stage in productions as diverse as A Midsummer’s Night Dream, The 39 Steps and Sister Act to name just a few. As a author he has written a book on the history of Letterkenny and a children’s play, Echoes of Time, commissioned by An Grianán to celebrate Letterkenny’s 400th anniversary. 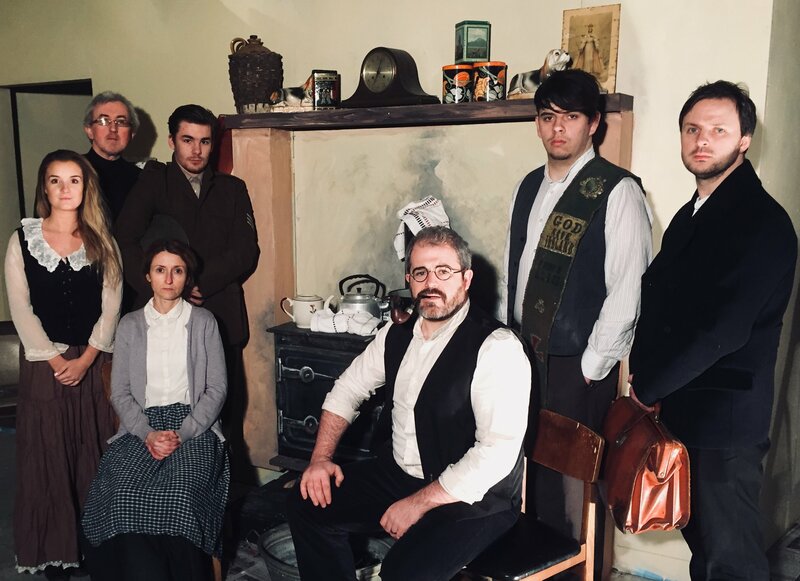 Inspired by archive reports and eye witness testimonies, his new play Beneath An Irish Sky looks at the events of 1916 from a Donegal perspective. It is a fictionalised account of one man’s journey through those those turbulent times, questioning what made him pick up a gun to fight for his country and how one moment in his youth affected the rest of his life. This dramatic reading will be directed by David Grant and will feature a cast of 8 actors. David Grant has enjoyed a varied career in theatre throughout Ireland as director, critic and teacher. He has been Managing Editor of Theatre Ireland magazine, Programme Director of the Dublin Theatre Festival and Artistic Director of the Lyric Theatre, Belfast and has directed more than a hundred theatre productions ranging from Shakespeare to new and devised work. He currently lectures in drama at Queen’s University, Belfast. He has directed several productions for An Grianán: Frank Pig Says Hello (2014), A Midsummer Night’s Dream (2008) and Thomas Kilroy’s The O’Neill (2007). Letterkenny has a few historic connections to the Rising – the Pulpit of the Four Masters in St. Eunan’s Cathedral was designed and sculpted by the family of Patrick Pearse, and Joseph Sweeney, who fought at the GPO, attended St. Eunan’s College. A Terrible Beauty: Remembering 1916 is our short season of events marking the centenary of the Easter Rising. We have three shows which will look at 1916 from three different perspectives. We have a dramatic reading of Kieran Kelly’s new play Beneath An Irish Sky which looks at the impact that the Rising had on Donegal. Then we have two Letterkenny performers, John D Ruddy and Brian Gillespie, starring in The Rising, a fast paced and entertaining show which looks at the events that led to 1916 including the first World War. Finally we have Left Behind, a music concert from Michelle O’Rourke and composer Simon O’Connor which is inspired by some of the women involved in the Rising. How did the events of Easter week 1916 affect the people of Letterkenny and Donegal? Based on archive reports and eye witness testimonies, Beneath an Irish Sky is a fictionalised account of one man’s journey through those those turbulent times, questioning what made him pick up a gun to fight for his country and how one moment in his youth affected the rest of his life. Written by local author and historian Kieran Kelly, Beneath An Irish Sky will be presented as a rehearsed reading featuring a cast of eight actors directed by David Grant (Frank Pig Says Hello, A Midsummer Night’s Dream). Find out more. The Rising: John D Ruddy reprises his role alongside new cast member Brian Gillespie (not pictured). Touring nationally to great acclaim, this production features two local performers – John D Ruddy is a Letterkenny based actor whose recent roles include Fiesta, The 39 Steps and I Would Walk These Fields Again. A native of Letterkenny, Brian Gillespie now lives in London where he is the artistic director of B-Hybrid Dance. Described by the Irish Times, as “90 minutes of exhilarating and terrifying factual theatre”, The Rising relives the tumultuous days of the 1916 Rising through the eyes of two friendly adversaries, O’Brien, a Catholic, and Mc Keague, a Protestant. Over an action packed performance O’Brien and McKeague will tell the story of this pivotal event in Irish history in vaudeville style, with humour, song and dance, as they re-enact the Rising and the events that led to it, including World War 1. Find out more. Composer Simon O’Connor and vocalist Michelle O’Rourke present Left Behind: Songs of the 1916 Widows. 1 April 2016. Written by composer and curator Simon O’Connor, and commissioned and presented by vocalist Michelle O’Rourke, Left Behind is a new collection of songs to mark the centenary of the 1916 Easter Rising.Drawing on the experiences of women closely connected to the conflict, including the wives of prominent rebel leaders, O’Rourke and O’Connor have created a unique suite of compositions that offer an emotional, human perspective on a narrative that is too often told in baldly male heroic terms. Beginning life as simple vocal/piano pieces, these songs have been transformed with the addition of O’Connor’s former bandmates from celebrated Dublin rock band The Jimmy Cake. This small ensemble brings a volatile, dramatic energy to the retelling of the stories of Lillie Connolly, Grace and Muriel Gifford, Agnes Mallin and others. Find out more. These events supported by Donegal County Council and the Ireland 1916 Cetenary programme. Our new Arts Magazine is here! An Grianán Extra – A Wee Bit More is our new arts magazine. Designed to compliment our standard events brochure, Extra offers a slightly more in depth look at some of our upcoming shows. We have a profile on Donegal playwright Frank McGuinness written by Jessica Trainer, Literary Manager of the Abbey Theatre as well as a piece by theatre-artist-in-residence Guy Le Jeune talking about what he has planned for his residency. Cover art for An Grianán Theatre’s arts magazine by Laura Buchanan. Our cover art is by artist Laura Buchanan and is inspired by photos from the 1916 Rising. We also have a look back at the controversy surrounding The Kings of the Kilburn High Road when we first had it back in 2000. Writer and local historian Kieran Kelly introduces his new play Beneath An Irish Sky which looks at how the events of the 1916 Rising affected Donegal. We will be holding a rehearsed reading of it as part of our short series events remembering 1916 which you can also read about in Extra. Our director Patricia McBride offers her pick of the season as does well known writer and performer Little John Nee. What shows did they pick? Read the magazine now to find out! You can read An Grianán Extra – A Wee Bit More online now. Hard copies are available at our box now. Back cover art for An Grianán Theatre’s arts magazine by Laura Buchanan. Letterkenny: Where the Winding Swilly Flows is a new and exciting history book by local writer, actor and schoolteacher Kieran Kelly. We are very pleased to be hosting its official launch tonight at 7.30pm. In addition to the book launch we’ll also be hosting a reprise of Kieran’s short play Echoes of Time, originally produced by An Grianán to mark Letterkenny’s 400th anniversary. Entry is free and light refreshments will be served. Copies of the book will be available on the night in both paperback and hardback. Only 100 copies of the hardback version have been printed so we expect those to be in demand. Throughout the book’s 22 chapters, the entire history of the town and local region have been meticulously researched and explored, starting with the formation of the valley in the last Ice Age with theories to how the town got its name, right up to the present day. Along the way, you will find out interesting facts about the town of Letterkenny that perhaps you never knew before. For example, did you know that Charles Stewart Parnell, Michael Palin (of Monty Python fame) and Patti Boyd (ex-wife of Beatle George Harrison) all have ancestral descent from Letterkenny? Or that at one stage, over ten thousand people were packed into the Market Square to attend a monster Land League meeting at which Michael Davitt spoke? Or that Donegal won their first Ulster Junior Championship title in Glencar? As well as meeting many colourful characters who helped shape and define what Letterkenny would eventually become, the book explores ancient Gaelic battles along the banks of the River Swilly, the formation of the modern town in the Ulster Plantation, the various families of the Ascendancy Big Houses, the rise of local government, the building of the Cathedral and various educational establishments, the local impact of World War 1, the arrival of the Port and Railway systems, twentieth century industrial and commercial development as well as in-depth history of various sports and drama clubs important in the social integration of the town’s inhabitants. Complemented by an assortment of maps, graphs and photos, this bright and colourful publication also hosts new illustrations by local artist John Ruddy that cover these key events important in the town’s history. Echoes of Time is Kieran’s play that looks back at Letterkenny’s plantation past. It toured local primary schools with great success in 2011. Original cast members Nora Kavanagh and Eoghan Mac Giolla Bhride are joined by youth theatre member Patrick Quinn soon to be seen in Bugsy Malone. Like the book it contains many snippets about Letterkenny that you probably haven’t heard before. Tues 28 October at 7.30pm. Admission is free. Light refreshments will be served.